We set off from Vacha in the chilly morning and rode along the Werratal bicycle route beside the Werra river to Bad Salzungen, a spa town. After this some route finding experiments led us to take the road less travelled. Many people think that this is what one should do in life, but it is not always the case, especially if you are on a bike in the Thuringer Wald. This road started as a 2 wheel track, then became a rocky track inclining upwards, then grassy and then not really discernible at all. We found the way back to a proper road, but had not learned our lesson, and prompted by Google Maps woman (to whom we now refer as Wanda as she is supposed to be helping us wander around), we took another grassy track that deteriorated and took us into a forest. We retreated and eventually found a sign posted bike path that took us up a long steady climb which we enjoyed more as it was on smooth tarmac! At the top was a large hotel, Waldgaststatte Am Kissel, where we stopped for coffee. As Ian says, the route experiments help to keep the coffees apart which is what you want. A long steep descent followed into Ruhla – our climb from the other side was much more gradual – then more descending into Wucha. Our destination was Gotha, only another 20km, but this was an elusive place that didn’t seem to get any closer the further we rode. We diligently followed signs but ended up a bit lost when the bike path suddenly evaporated. The thing to do in any such situation is to ask the nearest person, so we did and the next passing cyclist escorted us on to a better route. We were soon alongside the road more travelled – an autobahn. Gotha kept getting closer and then further away, according to the distances on the bike path sign posts. 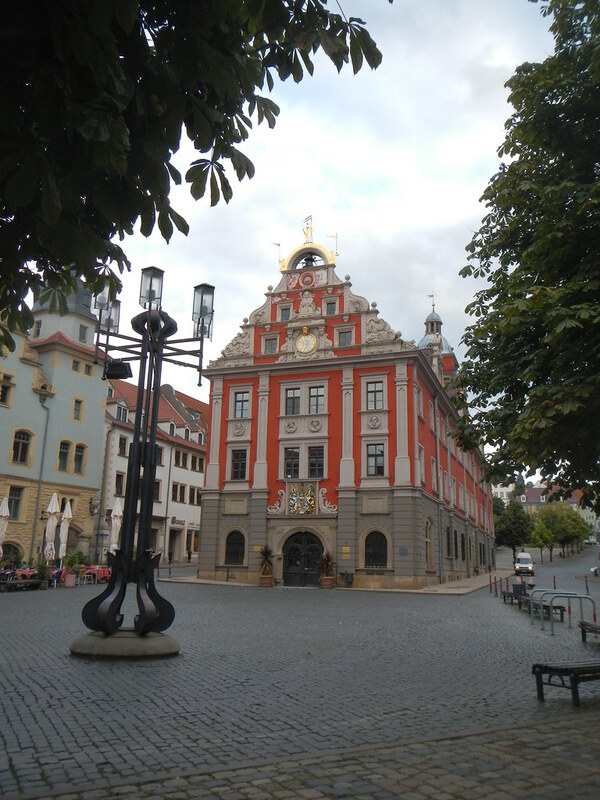 In the end we made it into town, and a fine impressive place it is with a massive schloss, deep orange Rathaus and many other fine features. This entry was posted on 22 August 2014 at 7:39 pm and is filed under Europe 2014. You can follow any responses to this entry through the RSS 2.0 feed. You can leave a response, or trackback from your own site. I am always looking for medieval ukulele players – found something close in Erfurt! Thanks Helen – we take Wanda with several grains of salt and her pronunciation is not improving at all! Calorific kuchen is the answer to many problems!